For most people 35mm is the only film format they come in contact with or have heard of. It’s no wonder as it’s been the most popular format since it was introduced. Its affordability, economy and popularity with journalists can certainly be attributed to this. However, for those wanting more from their images, there is just that! The professional format, better known as medium format (120 and 220 roll film) offers images 2-3 times the size of the 35mm frame. If it size you’re after then this is the way to go. Half of the pictures on this site are produced on medium format. But wait it doesn’t just stop there. Film keeps on going up to 4x5in (those large old wooden cameras) and even larger if you plan on mapping countries from high altitude. Below shows a useful comparison to put things into perspective. 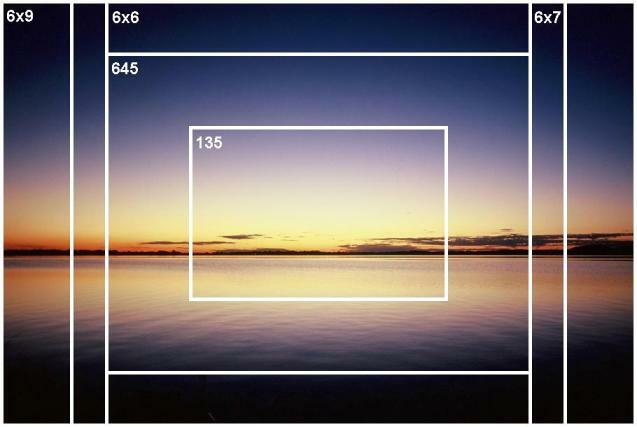 The 135 frame represents the standard 35mm image size (36mm by 24mm) and the rest are various medium format film sizes.